Learn more about the eVALUEator® investment screening tool. This week, Bob and Mary Jo interview David Hart, the president of sales and marketing for eVALUEator®. eVALUEator® is a tool for screening investments according to morally and biblically-responsible values. It is a tool for giving investors knowledge and the ability to be a good steward and stay away from various activities. 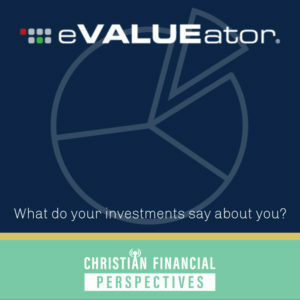 Christian Financial Perspectives goes in depth with Dave Hart explaining the history behind eVALUEator®, those who typically use the tool, and how they find various activities that different corporations are supporting.